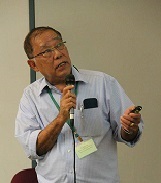 Dr Nyan Taw spoke at our 2013 Biofloc Technology at Temasek Polytechnic together EM Prof Yoram Avnimelech. We are inviting Dr Nyan Taw again for our Intensive Shrimp Technology 2019 workshop to be held at Republic Polytechnic from 26 to 28 September 2019. Learn from his extensive worldwide experience using biofloc technology in open pond conditions.